I have been morbidly curious about flounce-type novelty yarns. I satisfied that curiosity when I bought a skein of Starbella from A.C. Moore on Saturday. I then proceeded to knit what turned out to be what I think is an ugly scarf. My husband said it looked like a pile vomit. I think he’s right. Hence, the Barf Scarf. What is the general opinion of flounce yarns out there? I have learned I don’t like them. I had to try it. I HAD to…..one of those fads that should’ve been left alone. At least my curiosity has been sated. The colors aren’t too hideous, I will say that. 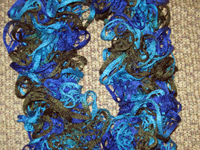 Still, the frilly frou-frou –ness of the scarf is just not me, so I will give it as a gift to someone who would like it. I have no idea who that is yet, but I’ll figure it out. The lesson learned: With knitting, it’s always good to try something new. It may work. It may not. And you may end up with an ugly scarf, but, eh, at least I learned something. Previous Previous post: Beading Night is Back! 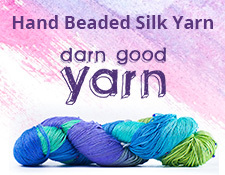 My LYS owner has been selling yarn like this and EVERYONE wants it! She's almost sold out of her very large stock. I think the scarves look good and unique, and a non-knitter would love it, but as a knitter, I find it cheap and not very amazing given how easy they really are to make. It's the same with mine. It flies off the shelves. I think part of it was the letdown was,oh, it's just knit stitches.